Andrii Fert researches state-church relations in the late Soviet Union. He is a graduate student at Kyiv Mohyla Academy, and works for DVV International. “Over the last few months, the lexicon of many Ukrainians has been enriched by two new words: ‘Tomos’ and ‘autocephaly.’ These words, whose literal meanings are ‘religious decree’ and ‘religious autonomy,’ have been all over the newspapers, social media and TV screens. 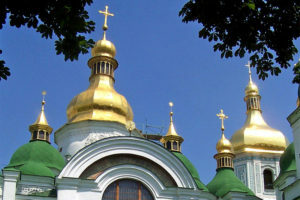 In April this year, Ukraine’s president and parliament asked the Patriarch of Constantinople, the highest arbitrator in the Orthodox world, to recognise the canonical independence of the Ukrainian Orthodox Church. Religion, a subject that the media normally ignore outside Christmas and Easter, has dominated headlines and public debate ever since. And all because for many, the Tomos is a kind of declaration of Ukrainian independence – not so much religious independence, but political. But a closer look at the situation shows that it is less a matter of ‘freedom from influence’ or the unification of several denominations. Rather, this is about the creation of symbolic capital that will give Ukraine’s political elite an advantage ahead of next year’s elections….